Does the anesthetic technique influence the epinephrine and norepinephrine concentration during pelvic surgery? Background: Epinephrine and norepinephrine concentrations increase by up to ten-fold immediately after surgical injury depending on the severity of the injury. However, the plasma levels of epinephrine and norepinephrine do not necessarily increase concurrently. The plasma epinephrine levels increase for about 48 h, while the norepinephrine levels remain elevated for about 8-10 days after injury. The choice of anesthesia has been shown to influence the secretion of epinephrine and norepinephrine. Materials and Methods: We compared the effects of balanced combined spinal-epidural anesthesia (CSEA, n = 20) and general anesthesia relaxant (GAR, n = 20) on epinephrine and norepinephrine concentrations during major pelvic surgery in patients with uterine mass > 20 weeks gestation. 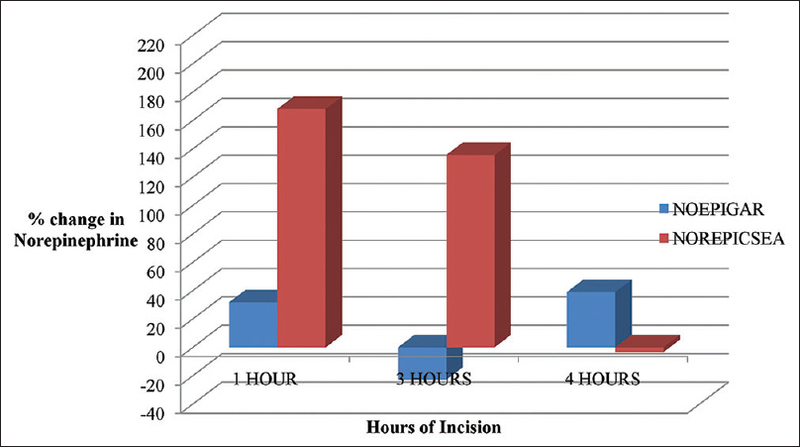 Blood samples for epinephrine and norepinephrine were analyzed at preinduction and 1, 3, and 4 h after surgical incision using enzyme-linked immunosorbent assay technique. Results: The mean norepinephrine concentration differs significantly after incision; at 1 h, CSEA 230.11 ± 42.85 versus GAR 51.25 ± 29.15 pg/ml, P = 0.015; and at 3 h, CSEA 116.22 ± 39.91 versus GAR 27.00 ± 19.89 pg/ml, P = 0.045. The norepinephrine concentrations increased from preinduction values after incision; at 1 h, increased in CSEA by +168% but increased in GAR by +31.7%; at 3 h, increased in CSEA by +35.64% but decreased in GAR by -22.85%; while at 4 h, decreased in CSEA by −3.37% but increased in GAR by +38.94% , P = 0.04 [Figure 2]. The mean epinephrine was comparable during the study, P > 0.05, while the mean heart rate, mean arterial blood pressure, and estimated blood loss were significantly lower with CSEA. Conclusion: We have demonstrated that in patients with uterine mass >20 weeks gestation, CSEA when compared to general anesthesia resulted in an initial increase in mean norepinephrine concentration 1 h after surgical incision followed by gradual decrease toward preinduction values. The increase in epinephrine concentrations recorded during gynecological procedure is relatively greater than that of norepinephrine, while during upper abdominal injury, the main hormone secreted is norepinephrine. Hypovolemia has been shown to be the greatest stimulant of catecholamine secretion, and the levels of catecholamine reduce appreciably after restoration of blood volume. We compared the effects of combined spinal-epidural anesthesia (CSEA) and balanced general anesthesia (GAR) the secretion of epinephrine and norepinephrine concentrations and changes in blood pressure (BP) and heart rate (HR) during major gynecological surgery. After approval by the Human Research Ethics Committee of our institution and written informed consent, 40 American Society of Anesthesiologists 1 and 2 adults aged 20–60 years scheduled for elective myomectomy or total abdominal hysterectomy were recruited. To achieve a power of 80% and significance level of α = 0.05, a minimum sample size of 20 was considered appropriate. This was based on a randomized trial comparing intraoperative epinephrine changes during general anesthesia and CSEA. Randomization was performed using a sealed envelope with the type of anesthesia written on a plain paper. Patients excluded were those with endocrine, hepatic, cardiac, or renal disorders, ingestion of any medication known to affect metabolism (such as corticosteroids or adrenergic blockers), known hypersensitivity to lidocaine and bupivacaine, and history of severe sciatica or back surgery, which contraindicates the use of epidural catheters. All patients received premedication (oral diazepam 10 mg nocte and oral ranitidine 150 mg) on call to theater. All operations started between 08:30 and 10:30 h.
In the CSEA group, all patients were preload with intravenous (IV) fluid 0.9% normal saline (10 ml/kg) over 20–30 min. With patient in the sitting position, an epidural catheter was inserted at the lumbar vertebrae level between L3 and L4 before surgery was commenced using the loss of resistance to saline technique. A test dose of 4 ml of preservative-free 1% lidocaine in 1:200,000 epinephrine (RotexMedica, Trittau, Germany) was injected to eliminate accidental intrathecal or IV placement of the catheter. Afterward, CSEA was established at the lumbar vertebrae level between L4 and L5, segmental block (T4 through S5) with 0.5% heavy bupivacaine (0.2 mg/kg) with preservative free fentanyl (25 μg), and the block was confirmed using the loss of sensation to pinprick. Epidural anesthesia was initiated when there was a two-segmental regression of sensory block with the injection of 5 ml of 0.5% plain bupivacaine. Thereafter, boluses of 0.5% plain bupivacaine (5 ml) with fentanyl 5 μg were administered every 30 min for 1 h and subsequently 3 ml of 0.5% bupivacaine combined with fentanyl 3 μg every 30 min till the end of the surgery; however, if the sensory level was still at T5/T6 dermatome, the epidural dose was missed. Postoperative analgesia was continued with injection of 5 ml of 0.125% plain bupivacaine and 5 μg of fentanyl 4 hourly for 24 h.
In general anesthesia relaxant (GAR) group, all patients were preoxygenated with 100% oxygen for 3–5 min, anesthesia was induced with IV propofol 2 mg/kg and fentanyl 1.5 μg/kg, and endotracheal intubation was facilitated with pancuronium 0.1 mg/kg. GAR was continued with isoflurane 1.0%-2.5% in oxygen and pancuronium, while analgesia was provided by IV fentanyl l μg/kg 30 min after induction and 0.5 μg/kg at 30 min interval for 1 h, IV. Residual muscle paralysis was reversed with atropine 0.02 mg/kg and neostigmine 0.04 mg/kg. Postoperative analgesia was continued with IV pentazocine 0.5 mg/kg 6 hourly and diclofenac 1 mg/kg 8 hourly for 24 h. In all patients, hemodynamic monitoring was performed with a five-lead electrocardiogram, noninvasive BP, oxygen saturation, and temperature, while capnography was included in the GAR group. Fluid therapy included correction for preoperative deficit, maintenance fluids, and replacement of ongoing losses. Isoplasma was administered when estimated blood loss (EBL) was greater than 500 ml. Blood samples were withdrawn before induction and 1, 3, and 4 h after surgical incision into an ethylene diamine tetraacetic acid bottle. Epinephrine and norepinephrine were assayed using enzyme-linked immunosorbent assay technique. Blood samples were immediately centrifuged at 4°C (3000 g; 10 min), and the obtained plasma was stored at −20°C until analysis. On the day of analysis, the blood samples and reagent were kept for 15–30 min to reach a temperature of 18°C–24°C. The reference interval for plasma epinephrine concentration of <100 pg/ml and plasma norepinephrine concentration of <600 pg/ml (Gateways Medical Corporation Medfield, MA, USA). The primary outcome was determined and compared the effect of CSEA and GAR on epinephrine and norepinephrine levels in response to major gynecological surgery. The secondary outcome was determined and compared the effect of CSEA and GAR on mean BP, HR, and EBL in response to major gynecological surgery. Data were analyzed with Statistical Package for the Social Sciences (SPSS®) for Windows 17 computer Software Program, Illinois, Chicago, USA. Intergroup and intragroup comparisons were done by independent sample t-tests and paired sample statistics, respectively. Values were expressed as means with standard deviation. A nonparametric test (Mann–Whitney U-test) was used to compute the differences between the two study groups with respect to serial sampling. The changes within the groups were evaluated by nonparametric tests. Two-tailed P values were reported and a P < 0.05 was considered statistically significant. Hypotension was described as systolic BP (SBP) <90 mmHg or a 30% decrease from baseline BP or mean arterial pressure (MAP) <70 mmHg, and hypotension was treated with a bolus of 200 ml of isoplasma solution; if the hypotension persisted for greater than 5 min, IV ephedrine 0.01 mg/kg was given. Severe bradycardia was described as HR below 50 bpm, which was treated with 0.01 mg/kg atropine. Adequate regional anesthesia described as the achievement of anesthesia at sensory dermatome 5th thoracic level that was associated with a pain-free cesarean section. The two groups were comparable in terms of mean age, weight, height, body mass index and packed cell volume, and the duration of surgery and anesthesia (P > 0.05). However, the mean EBL was significantly lower in the CSEA group, P = 0.036 [Table 1]. The preinduction norepinephrine was comparable in both groups; GAR 35.00 ± 14.66 versus CSEA 85.67 ± 33.77 pg/ml, P = 0.480. The mean norepinephrine differs significantly in both groups after incision; at 1 h, GAR 51.25 ± 29.15 versus CSEA 230.11 ± 42.85 pg/ml, P = 0.015; at 3 h, GAR 27.00 ± 19.89 versus CSEA 116.22 ± 39.91 pg/ml, P = 0.045, and at 4 h, GAR 48.63 ± 29.51 but decreased in CSEA 82.78 ± 21.29 pg/ml, P = 0.359 [Figure 1]. The norepinephrine concentrations increased from preinduction values after incision; at 1 h, increased in CSEA by +168% but increased in GAR by +31.7%; at 3 h, increased in CSEA by +35.64% but decreased in GAR by -22.85%; while at 4 h, decreased in CSEA by −3.37% but increased in GAR by +38.94% but [Figure 2]. The mean epinephrine in both groups during the study period. At preinduction, CSEA 25.78 ± 23.03 pg/ml versus GAR 18.63 ± 14.67 pg/ml, P = 0.641, and after incision, at 1 h, CSEA 27.67 ± 22.92 pg/ml versus GAR 26.25 ± 20.16 pg/ml, P = 0.867; at 3 h, CSEA 22.56 ± 17.67 pg/ml versus GAR 21.00 ± 11.31 pg/ml, P = 0.743; and at 4 h, CSEA 18.75 ± 17.73 pg/ml versus GAR 23.67 ± 21.22 pg/ml, P = 0.707 [Figure 3]. However, the mean epinephrine concentrations increased from preinduction values after incision; at 1 h, increased in CSEA by +7.33% but increased in GAR by +40.9% ; at 3 h, decreased in CSEA by -12.49% but increased in GAR by +12.72%; while at 4 h, decreased in CSEA by −27.27% but increased in GAR by +27.05%, [Figure 3]. 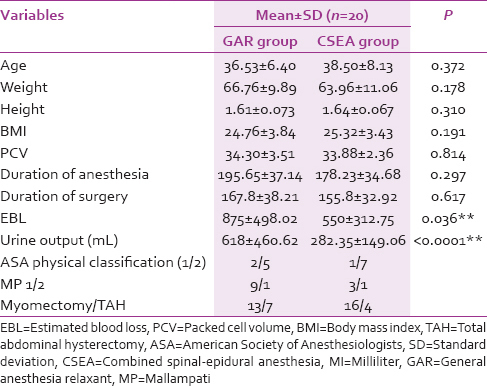 The changes in mean intraoperative MAP in groups GAR and CSEA are shown in [Figure 4]. The preinduction MAP in both groups was similar (GAR 99.80 ± 13.88 versus CSEA 94.47 ± 7.72 mmHg, P = 0.168). The MAP in CSEA was significantly lower than GAR during the study, except for an occasional transient increase in GAR group. The changes in intraoperative HR in groups GAR and CSEA are as shown in [Figure 5]. The mean preinduction HR was similar in both groups (GAR 88.75 ± 16.78 versus CSEA 87.06 ± 12.42 bpm, P = 0.220). The mean HR increased in GAR group but decreased in CSEA group; the HR was significantly lower in CSEA. The changes in MAP in the postoperative period in groups GAR and CSEA are detailed in [Figure 4]. The mean MAP in CSEA group (86.29 ± 8.99) was significantly lower than in GAR group (96.70 ± 12.82 mmHg), on arrival in the recovery room, P = 0.008. Thereafter, the mean MAP decreased in both groups during the postoperative period. We observed a predominant increase in norepinephrine concentration (168%) 1 h after incision during CSEA, which was unaccompanied by simultaneous increase in epinephrine level. Our observation mimics the changes seen during hysterectomy under general anesthesia and epidural analgesia in a similar study and during laparoscopic fundoplication. The authors attributed that their observation to the release of epinephrine via the adrenal gland is mediated centrally whereas norepinephrine release is from local stimulation of nerve endings, mediated peripherally during manipulation of the peritoneum and diaphragm, with stimulation of unblocked vagal nerves during surgery., The release of norepinephrine during CSEA in the 1st h of our study, we attributed to peritoneal irritation secondary to tissue manipulation and local stimulation of nerve endings. This may be because the analgesic effect of intrathecal fentanyl may be restricted to the immediate region of administration, due to minimal cephalad spread. Therefore, with the intrathecal injection located at L3/L4 lumbar interspace in our patients, the effect of fentanyl might have been limited to that region, while the observed sensory level was achieved was secondary to the spread of bupivacaine. Another explanation for our observation is the occurrence of severe hypotension (SBP ≤80 mmHg) in two patients, in whom IV ephedrine was administered in the first 30 min of anesthesia, which may also contribute to the surge in norepinephrine 1 h after incision. This we attributed to the sympathomimetic effect of ephedrine. This is because ephedrine causes an indirect stimulation of the adrenergic receptor system by increasing the activity of norepinephrine at the postsynaptic α- and β-receptors. The increase in norepinephrine observed by us was, however, not associated with concomitant surge in epinephrine level. Contrary to our observation with norepinephrine, during hip arthroplasty, when CSEA was compared with GAR was reported to cause a significant reduction in norepinephrine and epinephrine release. Unlike in our study, ephedrine was no administered in their study. In our study, the mean norepinephrine level was significantly higher in the CSEA group than GAR group at 1 and 3 h after surgical incision. This observation is unexpected as the neuromuscular blockade during general anesthesia was pancuronium, which has been reported to prevent the re-uptake of norepinephrine at nerve endings and to augment the release of norepinephrine causing a rise in norepinephrine concentrations. The use of IV fentanyl for induction and maintenance of anesthesia with the maintenance of normocarbia might have contributed to the suppression of epinephrine and norepinephrine during general anesthesia, because pain and increase carbon dioxide levels augment the secretion of epinephrine and norepinephrine. A neuromuscular blocking agent such as atracurium and rocuronium would have been preferred as they do not augment the release of epinephrine or norepinephrine; unfortunately, they were unavailable in our institution during the study period. The epinephrine and norepinephrine levels reported during general anesthesia in our study were higher than values reported by Breslow et al. The variation, we attributed to differences in the IV induction agents.. In our study, in general anesthesia group, IV fentanyl was administered at induction of anesthesia to suppress laryngopressor response, and normocarbia was maintained during surgery at 3.5–4.5 kPa. Similarly, the later maintained normocarbia at 3.5–4.5 kPa; they, however, attenuated the laryngopressor response with a combination of IV lidocaine and IV fentanyl. This will have a synergistic effect on the catecholamine suppression. This is because the stimulation of cervical sympathetic afferents via the vagus nerve during laryngoscopy, intubation and hypercarbia, increases sympathetic discharge with untoward detrimental effects on the cardiovascular system such as hypertension and tachycardia when the laryngopressor response is not obtunde., Transient hypertension and tachycardia present low risks to healthy individuals. This may, however, be hazardous to patients with cardiac disease such as uncontrolled hypertension and coronary artery disease. There are many pharmacological strategies for blunting hemodynamic response to tracheal intubation. IV lidocaine and opioids particularly fentanyl, remifentanil, sufentanil, and alfentanil are widely used because of their potency and short half-life. The use of thoracic epidural anesthesia (TEA) is gaining ground either in the avoidance of intubation or as an adjuvant to suppress sympathetic discharge during intubation. When established before induction of general anesthesia, TEA sometimes completely block the hemodynamic response during laryngoscopy and tracheal intubation. A significant increase in HR during general anesthesia and a decrease during CSEA was observed by us. 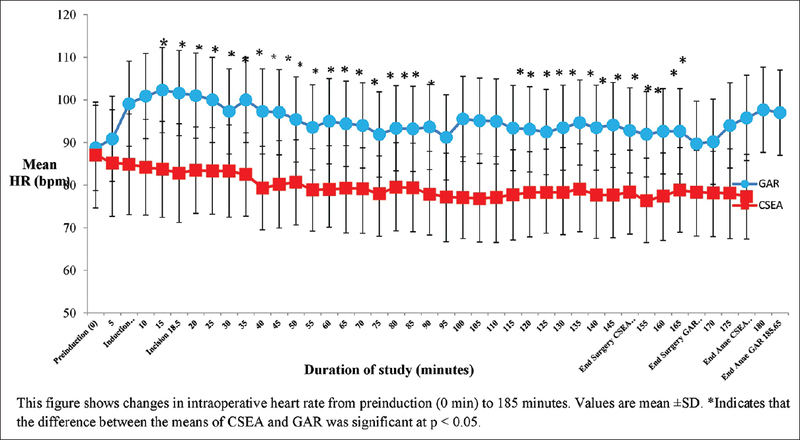 The mean HR in CSEA group was lower than in GAR group; however, the mean value was never below 60 bpm, but there was relative cardiostability. This is in agreement with previous reports., In our study, the HR observed during general anesthesia was higher than values reported by other researcher during pelvic surgery., The difference in HR was attributed to variation in the anesthetic agent. Isoflurane/fentanyl/pancuronium used for the maintenance of anesthesia by us might have contributed to our finding. Isoflurane produces a dose-dependent increase in HR, which occurs at low minimum alveolar concentration, while pancuronium augments the release of norepinephrine, blocks the re-uptake of norepinephrine at adrenergic nerve endings, and has vagolytic properties, and such may cause a rise in the HR. In contrast, Hong used nitrous oxide/enflurane/rocuronium for maintenance of anesthesia. The administration of nitrous oxide and enflurane are not associated with substantial changes in HR. On the other hand, rocuronium is cardiostable at 1–2 times ED95 dose results in tachycardia while increase in cardiac index have been reported at higher doses. A reduction in intraoperative HR noted in CSEA group by us, while Hong observed no change in HR. The difference in volume and dose of local anesthetic agent administered during epidural anesthesia in the two studies may be responsible. Epidural anesthesia was established with 0.5% plain bupivacaine (15.5 ± 2.2 ml) and fentanyl (25 μg) in our study, while Hong established epidural analgesia with 1% lidocaine (10 ml) and morphine (2 mg). The degree of neuronal blockade has been associated with the dose of local anesthetic agent, as low volume local anesthetic agents are relatively cardiostable. The initial increase in the norepinephrine levels during CSEA noticed by us was not followed by a concomitant increase in HR and BP. The norepinephrine concentrations were within the stated normal range; therefore, the increase in norepinephrine was not clinically significant and may not result in a rise in the HR and BP during CSEA. In addition, in our study, as the level of sensory block was aimed at T5/T6 dermatome level, the cardio-accelerator fibers were inhibited, which were expected to cause a decrease in the HR. Likewise, in an earlier study, the addition of epidural blockade to general anesthesia induced a postoperative increase in norepinephrine level, which did not result in corresponding changes in HR or BP. The EBL was lower with CSEA in our study; this is in agreement with previous observations during knee arthroplasty. The mean arterial BP was lower in the CSEA group; similar observations were reported in previous studies., The most common complication encountered with CSEA is hypotension, which is due to sympathetic nervous system blockade. This was observed in two of our patients with SBP ≤80 mmHg, who had ephedrine administered. A mild drop in BP is significant in high-risk patients such as the elderly and in those with underlying organ dysfunction in whom the auto-regulatory mechanism may be abnormal. However, these cardiovascular effects have been successfully treated with volume expansion and administration of vasopressor. The use of CSEA is, however, associated with reduced hemodynamic demand on the heart and decrease secretion of catabolic hormones. When compared to general anesthesia, CSEA demonstrated early postoperative recovery, no requirements for intubation, reduced overall mortality in 30% of patients undergoing surgical procedures on the lower extremities or pelvis. With CSEA technique, epidural analgesia can be provided in the postoperative period for 24–48 h. The anesthetist should aim at reducing the stress response during surgery by reducing or inhibiting sympathetic stimulation in the perioperative period. The limitation to the study included the inclusion of patients with hypotension in the study, who also received ephedrine a drug with sympathomimetic effect. In addition, the initiation of blood transfusion in some of the patients with considerable blood loss; the degree of stress response has been associated with the amount of blood loss. Different type of incision was used; some of the patients had midline incision and others Pfannenstiel incision. This may have contributed to difference in tissue handling and therefore tissue injury. In addition, pain score was not monitored in all the patients to ensure adequate analgesia. Pain has been associated with the initiation of stress response. In spite of this, we have demonstrated that the choice of anesthesia influences the release of catecholamines during pelvic surgery. 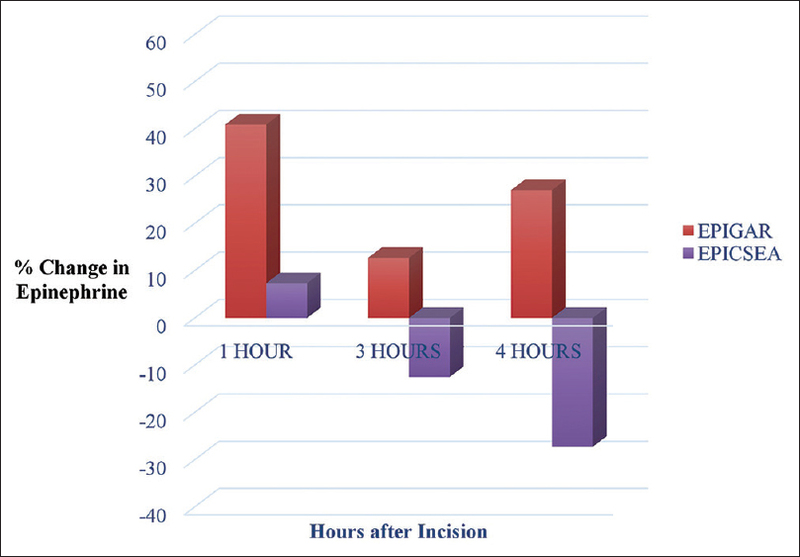 The blood norepinephrine level during CSEA increased 1 h after incision; thereafter, the values decreased. The initial increase was attributed to local release of norepinephrine during surgical manipulation. The norepinephrine levels, however, did not cause a concomitant increase in the BP and HR. Cuthbertson DP. Observation on the disturbance of metabolism produced by injury to the limbs. Q J Med 1932;1:233-46. Cuthbertson D. Metabolic changes. J Clin Pathol Suppl (R Coll Pathol) 1970;4:44-6. Douglas RG, Shaw JH. Metabolic response to sepsis and trauma. Br J Surg 1989;76:115-22. Desborough JP. The stress response to trauma and surgery. Br J Anaesth 2000;85:109-17. Sing M. Stress response and anaesthesia. Indian J Anaesth 2003;47:427-34. Myre K, Raeder J, Rostrup M, Buanes T, Stokland O. Catecholamine release during laparoscopic fundoplication with high and low doses of remifentanil. Acta Anaesthesiol Scand 2003;47:267-73. Eun-Hee C, Jong-Hak K, Hee-Jung B, Kim YJ. The effect of combined spinal-epidural anesthesia on stress responses during total knee replacement. Korean J Anesthesiol 2009;57:296-301. Epinephrine EIA and Norepinephrine EIA. Methodology for the quantitative determination of epinephrine in plasma and urine. ALPCO Diagn 2008;11:1-6. Ezri T, Zahalka I, Zabeeda D, Feldbrin Z, Eidelman A, Zimlichman R, et al. Regional anesthesia and pain: Similar incidence of hypotension with combined spinal-epidural or epidural alone for knee arthroplasty. Can J Anesth 2006;53:139-45. Yentis SM, Brighouse D, May A, Bogod D, Elton C. Epidural anaesthesia for caesarean section. In: Analgesia and Anaesthesia in Pregnancy A Practical Guide. London: WB Saunders; 2001. p. 89-93. Engquist A, Fog-Møller F, Christiansen C, Thode J, Vester-Andersen T, Madsen SN, et al. Influence of epidural analgesia on the catecholamine and cyclic AMP responses to surgery. Acta Anaesthesiol Scand 1980;24:17-21. Peng PW, Sandler AN. A review of the use of fentanyl analgesia in the management of acute pain in adults. Anesthesiology 1999;90:576-99. Kleinz MJ, Spence I. Pharmacology of the Autonomic Nervous System in Small Animal. Clinical Pharmacology. 2nd ed. Edinburgh;London:Elsevier Saunders, 2008. p. 59-82. Drug Database. Lake Forest, IL, USA: Hospira Inc.; 2008. Available from: www.drug database.com.org. [Last accessed on 2014 Jul 30, 22:06]. Breslow MJ, Parker SD, Frank SM, Norris EJ, Yates H, Raff H, et al. Determinants of catecholamine and cortisol responses to lower extremity revascularization. The PIRAT study group. Anesthesiology 1993;79:1202-9. Park SY, Koo BS, Lee JL, Cho SH, Kim SH, Chae WS, et al. Effects of thoracic epidural anesthesia on hemodynamic changes during tracheal intubation. Korean J Anesthesiol 2008;55:429-35. Skipworth J, Srilekha A, Raptis D, O'Callaghan D, Siriwardhana S, Navaratnam R, et al. Combined lumbar spinal and thoracic high-epidural regional anesthesia as an alternative to general anesthesia for high-risk patients undergoing gastrointestinal and colorectal surgery. World J Surg 2009;33:1809-14. Hong JY. Haemodynamic and ventilatory effects of preoperative epidural analgesia during laparoscopic hysterectomy using NICO. Singapore Med J 2008;49:233-8. Nitschmann P, Oberkogler W, Hertsig M, Schwarz S. Comparison of haemodynamic effects of rocuronium bromide with those of vecuronium in patients undergoing CABG surgery. Eur J Anaesth 1994;11:113-5. Stevens RA, Artuso JD, Kao TC, Bray JG, Spitzer L, Louwsma DL, et al. Changes in human plasma catecholamine concentrations during epidural anesthesia depend on the level of block. Anesthesiology 1991;74:1029-34. Goel M, Sharma M, Kulshreshtra A, Mashraqui S. Hemodynamic effects during combined spinal and epidural anesthesia: Role of fluid preloading and prophylactic vasoconstrictors. Internet J Anesthesiol 2009;22:1-5. Eldor J. Combined Spinal-Epidural Anesthesia (CSEA). Available from: http//www.anestesia-dolor.org. [Last accessed on 2014 Apr 04, 21:43].